iPhone users who live in cold climates may soon have a new option for keeping their fingers warm while trying to make a phone call or playing a game at the bus stop. A recently-published patent application reveals that Apple may be working on its own solution. Apple describes a glove that has both an inner liner and an outer shell. The shell “may include at least one aperture through which the inner liner may extend to operate the input mechanism of an electronic device.” In other words, Apple’s working on some kind of fancy system for exposing one’s fingertips through a glove to create the electrical feedback that the iPhone’s capacitive touchscreen needs to operate. From Apple’s descriptions, it sounds like these iPhone gloves would allow the liner to be removed. The tips on the other shell may be peeled back (or use an elastic ring) to expose the finger underneath, which would allow iPhone owners to control their devices in cold climates without having to completely remove their gloves. At this moment, a company called Dots, has offered The iPhone Glove for some time now. Its implementation places specialized tips on the outside of the glove, no peeling back or elastic material needed. 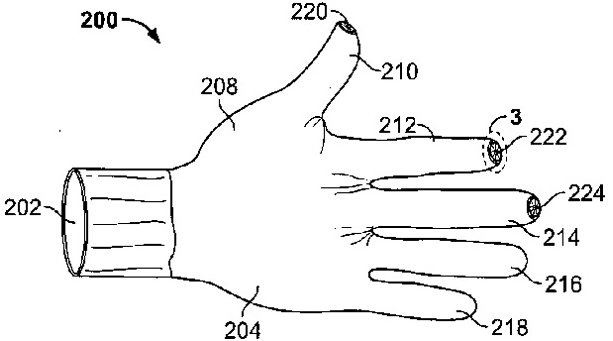 Of course, this is only a patent, and in no way a hard indicator that iGloves are on their way.